VolturnUS, a model-scale wind turbine designed and built at the University of Maine, became the first grid-connected offshore wind turbine in the Americas to provide electricity to the power grid in June 2013. Maine could use its offshore wind power expertise to boost manufacturing and support 2,100 jobs in that industry, according to a report released late Wednesday. 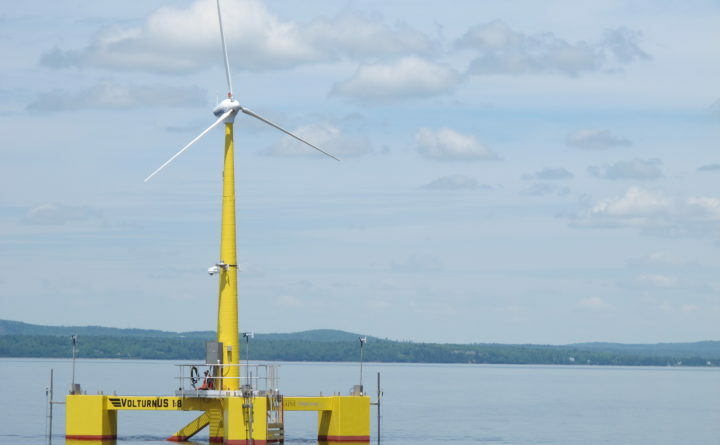 Based largely on advances in floating platforms for wind turbines developed by the University of Maine, the report by the American Jobs Project found that Maine is well positioned to benefit from rising demand for offshore wind technology. The report also cited as strengths interest from cooperative industry associations in the state, a growing network of composites manufacturers and immense offshore energy potential because of strong winds. “The U.S. offshore wind sector is about to take off, and Maine has an opportunity to shape this emerging industry,” said Mary Collins, co-author of the report and director of the American Jobs Project, a nonprofit based in Berkeley, California, that is funded by foundations. The University of Maine project, the first of its kind in the United States, is being held up as proposed electricity rates are under review by regulators. The report includes recommendations for developing wind power including re-establishing the Maine State Planning Office, which had expedited wind energy projects. Gov. Paul LePage dismantled it in 2012 to save money. Also included are establishing offshore wind certificate or degree programs to support a skilled workforce and establishing a Northeast Offshore Wind Innovation Center. The report was prepared in partnership with the Maine Center for Business and Economic Research at the University of Southern Maine, the Environmental & Energy Technology Council of Maine (E2Tech) and BVG Associates, a data company based in London. The 2,100-plus jobs include direct jobs like manufacturing and software development, and indirect jobs from suppliers. The study found that demand for offshore wind is expected to grow 16 percent annually through 2030. New England already is adding wind projects. A subsidiary of Central Maine Power’s parent company, Avangrid, won the right on May 23 to negotiate a contract for what would be the nation’s largest offshore wind project off the Massachusetts coast. And on May 30, Deepwater Wind said it will invest $250 million in Rhode Island and use 800 local workers to build a utility-scale offshore wind farm, according to the Providence Journal. The platforms used on projects to date are drilled and embedded into the ocean floor. The University of Maine platforms float, so they can be put further out into the ocean away from fisheries and eyesight, said Ryan Wallace, director of USM’s Maine Center for Business and Economic Research. The platforms and components could be sold to other New England states and areas in the Northeast. Local energy use also is part of the report. The University of Maine installed a pilot-scale project, the VolturnUS turbine, in 2014 off of Castine. It was the first floating offshore turbine in the United States to be connected to the grid onshore. The next step, the full-sized Maine Aqua Ventus project, hit a snag early this year when the Maine Public Utilities Commission decided to seek public comments on whether it should reconsider the rate for power it approved under a February 2014 agreement between the project and Central Maine Power. The project needs the PUC’s approval to get $87 million from the U.S. Department of Energy. The public comments are expected to be deliberated by the PUC commissioners on June 12, said Harry Lanphear, administrative director of the PUC. Wallace added that the new jobs will start as soon as that project can move ahead. Collins said the American Jobs Project chose to study Maine because the state had lost so many manufacturing jobs in the paper and pulp industries and is strong in wind technology. She said with additional training, many of the job skills from the paper industry are transferable to wind technology, for example, welding.